Changing the brake fluid in your pickup truck is important routine maintenance that has a significant influence on the integrity of the brake system performance and entire operation. Over time, brake fluid becomes dark and filled with contaminants that don’t allow proper performance. When water and other contaminants get into the brake fluid, it boils during moderate brake use and produce periods of brake fade. Changing the brake fluid ensures that the lubrication in the braking system is optimum, functional, and safe. Changing the brake fluid involves a process of bleeding the brake lines to flush the old fluid out of the brake system. The proper brake fluid must then be entered back into the system at the specified level. Getting StartedKnowing how to change brake fluid in your pickup is a beneficial skill that will come in handy and save money. It is not a complicated process and with the right tools it’s actually relatively easy. Without the use of a specialized machine or pump, two people will be necessary to properly drain the brake lines. One person will be needed to actually pump the brake pedal to bleed the lines and someone to drain the fluid into a proper container. First you should ensure that you have the proper DOT certified brake fluid to refill your vehicle. A vehicle designed for DOT 5 brake fluid must only use that fluid and DOT 4 vehicles can only use its respective fluid. DOT 3 designed vehicles can accept that fluid or DOT 4. Tools to have on hand include tubing that is the necessary length to bleed brake cylinder, a wrench for the bleeder valves, and a clear container. 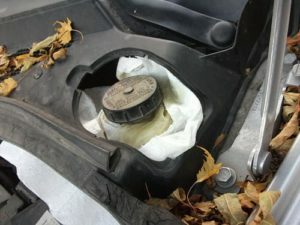 The cap should remain on the brake fluid reservoir during the process. If it’s necessary to raise vehicle, it should only be done with proper jacks or lifts. The brake cylinder should be located along with the bleeder valve that should be on the back side of it. With one end of the tubing already in the container, the other end should be placed on the bleed valve. The wrench should be used to loosen the valve slightly then the other person should begin pumping the brake pedal then holding it firmly approximately half way. As the pedal is being held the valve can be continued to be loosen until the fluid begins to come out the reservoir. The brake pedal should then be pushed down firmly, almost until to the floor and then the valve should be re-tightened. This procedure should be performed until no evidence of gaseous elements are present in the existing used liquid. This operation should be done on the remaining brake cylinders. After this, the brake fluid container on the pickup should be filled to the proper level and the work area cleaned.